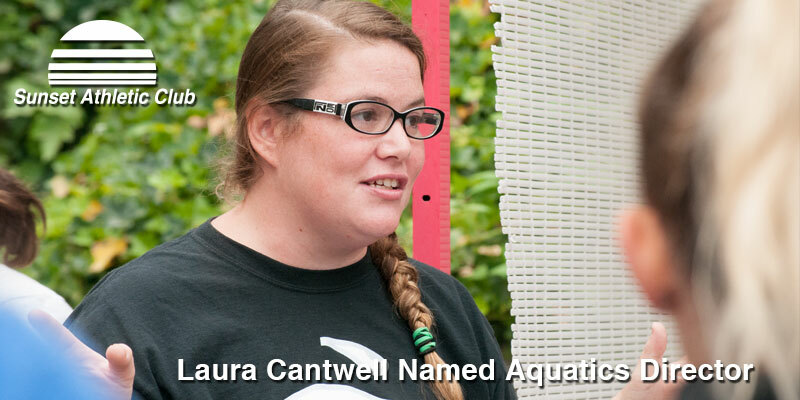 If you’ve had a child on swim team or in swim lessons, chances are you already recognize Laura Cantwell’s smiling face and unmistakable voice. With most of her lifetime spent in our pools, including the last 7 years as Outdoor Pool Director and SAC Attack Swim Team head coach, Laura was recently promoted to Aquatics Director. different world. “It was warm and less hectic, I loved it!” and she just kept coming back. Her most influential coaches include Andrew Heintz, who made her a captain, got her motivated to work hard and become a better swimmer. She still uses some of his coaching techniques today. Meg Schwartz was also inspirational to her becoming a leader in the SAC swimming department. About her plans as Aquatics Director; “I’m excited about the opportunities to expand the swimming programs and build into the SAC community. This fall, we’re adding a new Adult Swim Conditioning class, and hope to add an Introduction to Water Polo soon. Laura’s family join her at the club nearly daily. Her parents are still members. She met her S/O Tony “on the job”, he’s a familiar face at the service desk. Laura explains, “I don’t know life without SAC, because I’ve been a member since I was so young.” Her daughter loves the SAC Clubhouse and enjoyed trying squirts tennis this summer. Her son, the youngest, loves Kids Korner and playing in the racquetball courts. Both kids can be seen regularly in (of course) the swimming pools. Join our tropical-themed celebration at our Members Party, 1:00 - 4:00 pm on July 29! 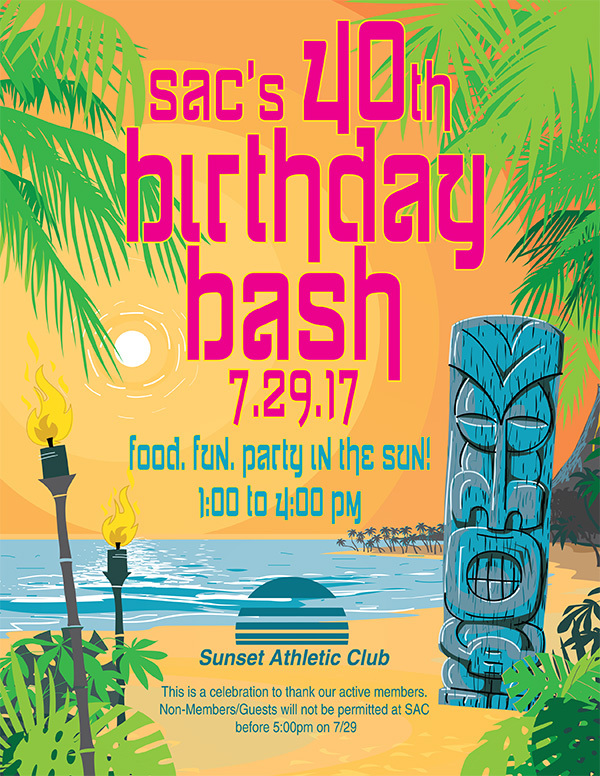 SAC Celebrates 40 Years of Fitness and Fun! PORTLAND, OR – Sunset Athletic Club – a landmark, family-oriented, sports, fitness and racquet club located near Sunset High School – has been celebrating their 40-year anniversary. 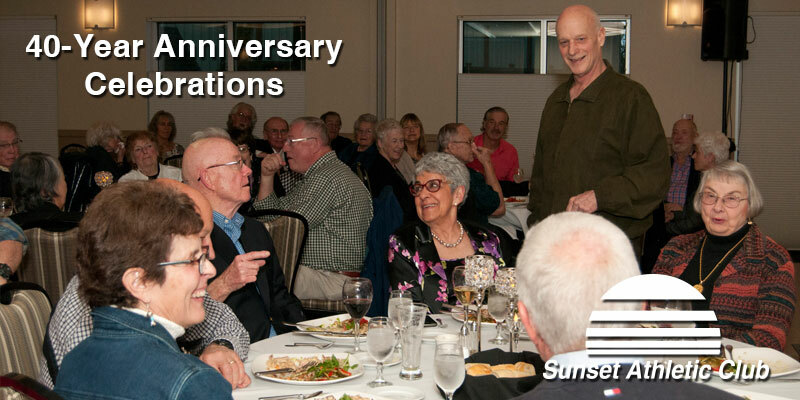 Their first celebration was an exclusive dinner event held in April for the alumni members who joined back in 1977. They are also planning an all-members 40-Year Blowout Party event to be held this summer, time and date TBA. The next year four indoor and two outdoor tennis courts were opened, along with the outdoor pool. The club built its reputation in the local sports and fitness communities for two decades. In 1995, a setback occurred when a fire closed parts of the club for weeks. The staff soon had the damage repaired and programs resumed. SAC experienced a huge expansion that began in 2002 with an extensive FitCenter upgrade. With the patience of their members, and a ton of hard work, they successfully worked through three more expansion phases over the next five years that tripled the size of the club. It’s now the second largest Athletic Club in Oregon. Their nod to the “green building” ethic earned them a feature article in Inc. magazine, (Green is the New Black, June, 2005). The facilities now include: Indoor Aquatics Center with three large pools (lap, exercise, therapy), Jacuzzi, steam and sauna rooms; outdoor heated pool and splash-play pad (seasonal); gym with two full basketball courts, elevated track and climbing wall; bistro for meals and snacks; FitCenter with extensive equipment; large Cardio Center theater; on-site licensed physical therapy; Kids Korner child care; plus extra amenities like locker rooms, pro shop and banquet/meeting facilities. The club is an epicenter for racquet sports, hosting multiple local and national tournaments each year on their seven indoor (and two outdoor) tennis courts, and nine racquetball courts (two also convert to squash). 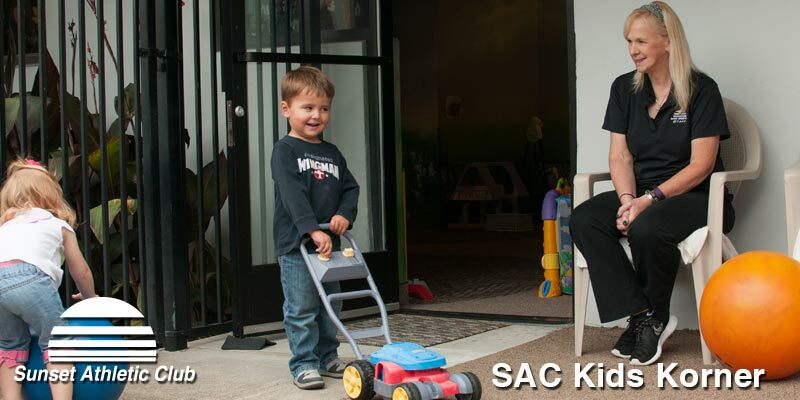 SAC is also a magnet for local kids, thanks to decades of summer and Spring-Break camps—and the unique SAC Clubhouse, a separate building dedicated to kids programs, activities and parties. True to its “community-centered identity,” Sunset High School racquetball and tennis competitors, as well as local athletes from other sports, train at the club. The SAC Attack swim team fields 200 kids every year in the Metro Swim League. Plus, the club looks for ways to help the community directly, including: sponsoring the Oregon Sports Academy and it’s many programs to help young athletes; supporting the Oregon Track Club Masters (ages 40+); helping to sponsor local school and sports organizations; and contributing used equipment to charities. Chuck, Carleen and the staff at Sunset Athletic Club are looking forward to serving their SW Portland community for years to come. Nobody did it better than Agassi...Ready to relive his 70s fashions and mullet hairstyle? The SAC “Vintage Agassi” doubles tournament runs April 12 – 15, 2017. Challenge your friends on the courts for this four-day event. Dress in 70s-80s style for our party and dinner Saturday night. 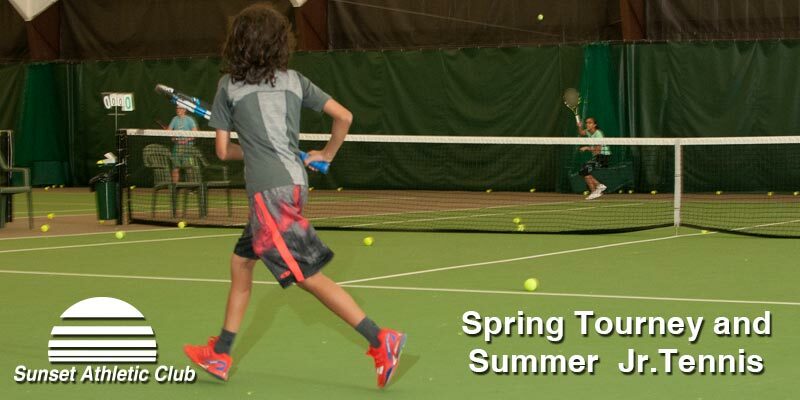 Summer is right around the corner so look for Junior Tennis Camps again – running all summer long DATES AND FLYER HERE. It is a later start for summer this year and we will have nine weeks of camp. Camps and weekday junior program will start June 26th. High School Invitational/Pre-Invitational will start the same day and go Mondays and Wednesdays all summer from 3:30 pm to 5:00 pm. Please verify with myself or one or our pro’s to make sure you are eligible for this class and the correct level. Invitational class is our highest level class for juniors. You all know Cheryl’s smiling face as she’s been an integral part of our Child Care facility for over 10 years now. She began by working with her mother Marge (who herself was a fixture at the club for many years), and they enjoyed many fun times together caring for our children. Congrats to Cheryl and thanks for years of loving care! Our Kids Korner staff is a qualified group of care providers offering a variety of activities to entertain and delight our SAC family of children. Kids Korner is located in the SAC Athletic Center building. *Parents must remain on campus at all times. Did you know? Kids Korner discounts are now available using our Kids Pass system. Contact staff for all details! 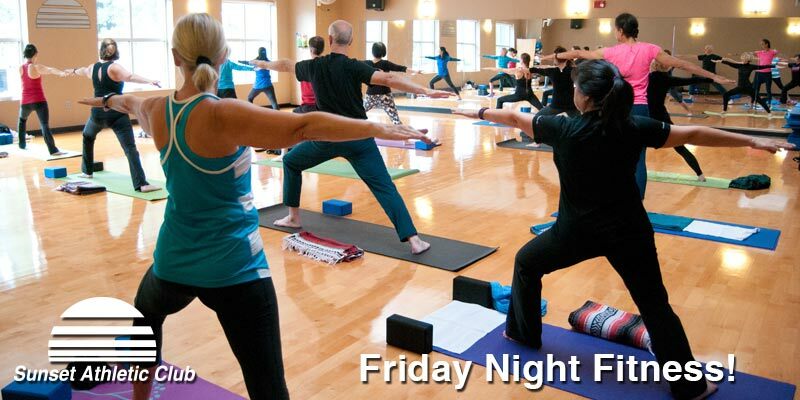 Ring in the New Year with our new “Friday Night Fitness” Specialty Classes, every Friday at 7:00 pm in the Mind-Body Studio. These Specialty Classes are an opportunity for our SAC community to come together, try some new workouts, and enhance our collective well-being. Classes begin January 6 and continue weekly through March 24. For your convenience in planning, you may refer to the schedules posted inside each of the Fitness Studios. The schedule consists of classes currently being taught in the Mind-Body Studio, as well as NEW CLASSES that we are considering for addition to the amazing variety we already offer. Join your dedicated instructors and plan on attending classes that will reduce stress and create more joy in your life! 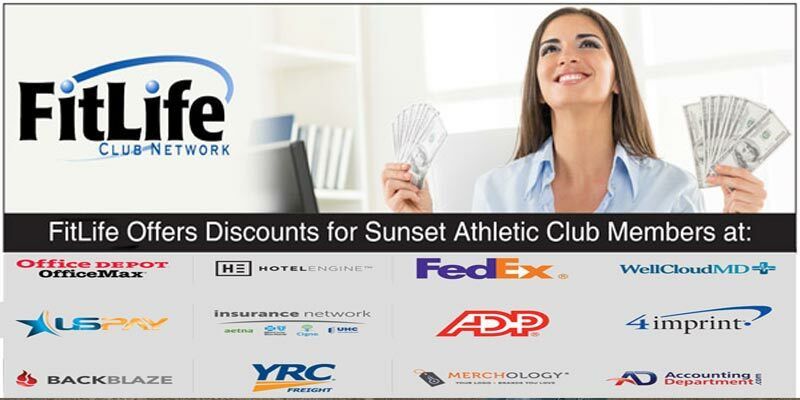 The FitLife Club Network is an association of independently-owned health and fitness clubs in the Pacific Northwest. Our reciprocity program gives each club’s members the ability to use approximately 80 different clubs in Oregon, Washington, Montana, Idaho, and Wyoming on a short-term basis while they are traveling. Are you a bargain-hunter? Our partnership with Fitlife offers SAC members access to their FREE Group Benefits Savings Program. SAC members are already eligible for discounts on Hotels, Shipping, Office Supplies and even Health Care! Just go to the Fitlife Savings Center, register your membership, and start saving.